The cochlea is the auditory portion of the inner ear. It is a spiral-shaped cavity in the bony labyrinth, making 2.5 turns around its axis. 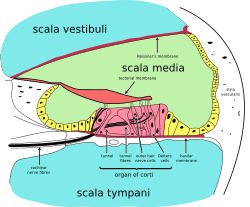 A core component of the cochlea is the Organ of Corti, the sensory organ of hearing, which is distributed along the partition separating fluid chambers in the coiled tapered tube of the cochlea. The name is from the Greek κοχλίας kokhlias ("snail, screw"), from κόχλος kokhlos ("spiral shell"). This is in reference to its coiled shape: the cochlea is coiled in most mammals, monotremes being the exceptions. This page was last changed on 13 August 2018, at 19:31.